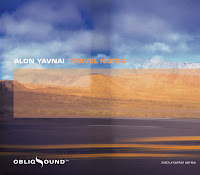 Not to inject too much of the reviewer into the review, but having listened to Alon Yavnai’s Travel Notes while passing through airports this week, I can say it travels well. Strongly rhythmic, yet also thoughtful and calming, Yavnai’s new release (on-sale yesterday) is a perfect soundtrack for those on the move. Again, not to overdo the travel metaphor, but Yavnai is no stranger to life on the road, having come to America from Israel by way of Costa Rica, and then playing and touring with Paquito D’Rivera for six years. His music is informed by a wealth of international influences, including his native Israel, the Middle East, and Latin America. The opening “Bayit (Home)” nicely captures the spirit of the album. Wistful, but not morose, it is an excellent feature for Yavnai as a composer and pianist, propelled along by his rhythm section of bassist Omar Avital and percussionist Jamey Haddad. “Yonatan” nicely continues that meditative but engaging vibe. Yavnai shows loads of technique, but consistently resists the urge to be showy. Yavnai’s title track has a somewhat brisker tempo, but not jarringly so. It is a striking composition, given slightly exotic accents with the addition of Avital’s oud, building in intensity as Yavnai and Avital trade dazzling statements. “Ilna B’nit (Beautiful Island)” is another richly textured original, evolving in intriguing ways around deceptive rests. Yavnai’s touch on the keys comes to the fore on four solo features, three of which are the only selections on Travel not penned by the leader. “Numi Numi (Sleep, Sleep),” Shlomo Gronich’s “Shir Ahava Tari (Fresh Love Song)” and Lea Goldberg’s “Yakinton” are given sensitive, almost classical-styled renditions. The aptly titled concluding track “Sof (End)” is a brief ruminative coda on a fresh and original jazz statement. Thou gh Travel is not Yavnai’s recording debut as a leader, touring as such is relatively new to him. Based the reception to his “pre-launch” at the Jazz Standard, he has a promising career ahead. He already has a distinct sound, and also seems like a nice guy, both of which should auger well for him. Travel is quite a rewarding session—definitely recommended.